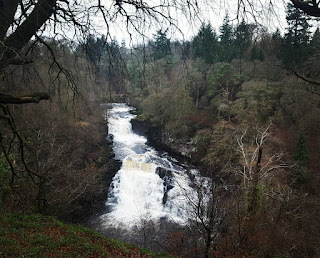 Curled up on the sofa that morning, reading my Grandma's book- "Keep Right On To The End Of The Road" and I read a section about the Falls of Clyde. I saw the word "Clyde" and knew it couldn't be too far away. So I googled it- 32 miles away, great! The first thing we saw as we entered New Lanark, was the very old fashioned looking builldings, a big row of houses on one side, and what looked like a fancy estate on the other. 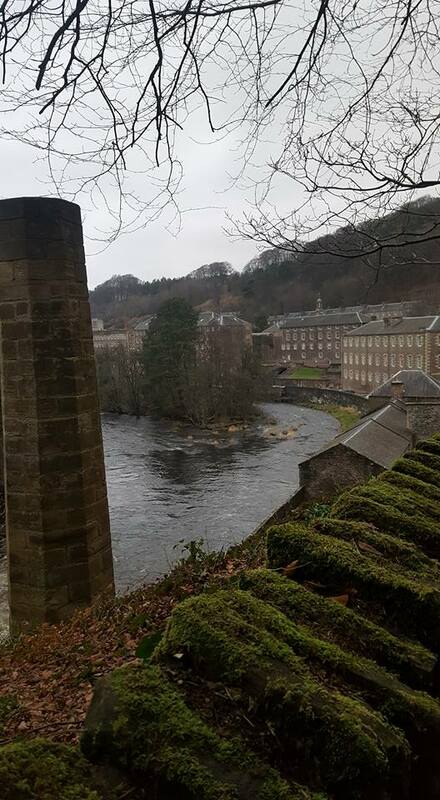 I came to find out that in actual fact, New Lanark was built in the 18th Centerary as a cotton milling village. It was founded in 1786 and operated until 1968. It closed down until 2006, when plans to knock everything down where stopped and the buildings restored. We parked our car in the main street of New Lanark, and I immediately saw a big blue sign with a badger on it pointing to the Falls of Clyde. 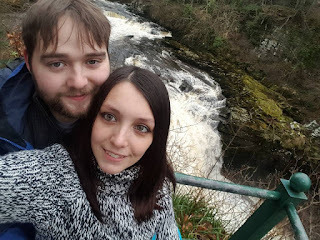 We walked through the paths of New Lanark, past the school for children, and a canal feature running through the village. (which I now know was for powering the cotton mill.) I noticed a little doorway on my right just before reaching the woodland path to the falls of clyde, and the explorer in me had to through. Down some stairs and to my left, there was a little waterfall, falling alongside the stairs. That was waterfall one of the day. From there, I notice an old chimney, coming out of a derelict looking building, and we heard the roar of a waterfall. This waterfall was wide and shallow, but thousands of gallons of water must pass to make noise like that! We stood watching it for a while, Waterfall number two. We carried on up the path we had initially set upon. The signpost then started pointing to Corra Linn. We were unsure of what we were going to find, the only other "Linn" I had ever seen, was Linn falls, which although pretty, was rather small. We went down the path and came across another waterfall, this one was wide and shallow, with a perfect curve. Rather beautiful. Just behind this waterfall we came across the boardwalk, with a sign saying "if flooded please use the alternative path." As we walked along the board walk there was a stick which reminded me of a wizard, so I just had to pick it up and let the inner child run through me. Stick in hand we carried a long the boardwalk. The boardwalk literally hung over the edge of the river and I could instantly understand how easily it could get flooded, as we carried on we found a Scottish Power Plant- Using Hydro Electricity, I assume- It was quite an eyesore, big pipes running alongside the path, but after 5 minutes it was forgotten as the falls appeared. The sheer power I felt approaching them was magical, the only thing I can liken to is Niagara falls, Pure power carved the shapes in the cliffs and made that loud roar sound like it was booming in my ear. It was beautiful. I looked further up the path and noticed an old house, that was now in ruins. It used to have two floors and a balcony but was now just an empty shell. I decided to climb up to the balcony from the inside. 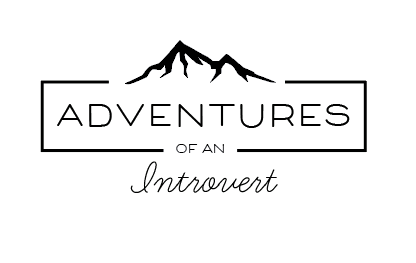 My inner extrovert breaking free. 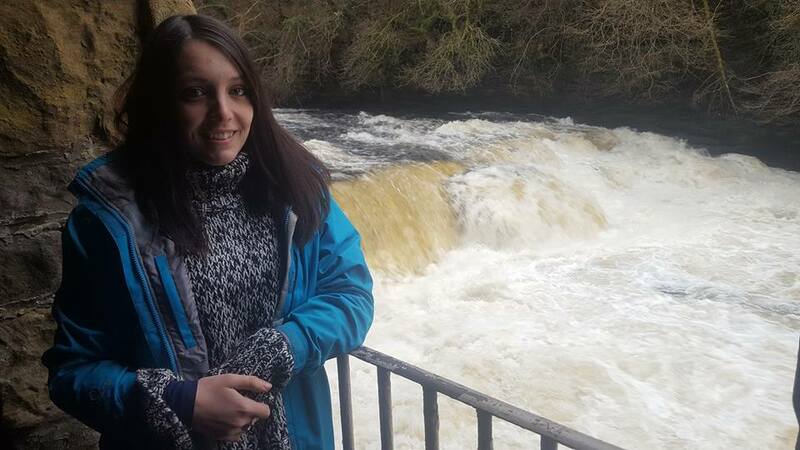 I climbed up confidentially and then stood on the steel frame of the balcony, watching the falls. 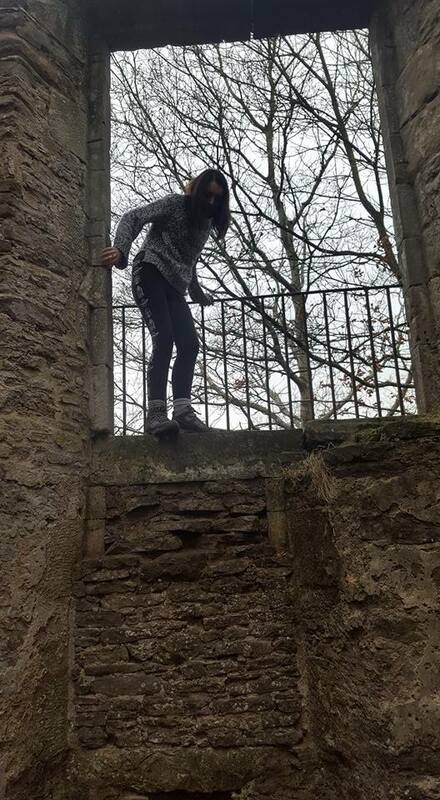 My fiance took a photo of me and I decided that I had better come down, I turned around and I suddenly felt like I was miles up, and my legs turned into jelly. "I can do this" I thought, "I'm only 7 1/2 feet up" I tell myself... but why do I do these things to myself. I opened my geocaching app, just to check whats about- surely this has to be an Earthcache. Its not, but there is a traditional geocache only 23m in a stump of a tree. I found it almost instantly. I then decided its time to part with my stick as I continue my journey. 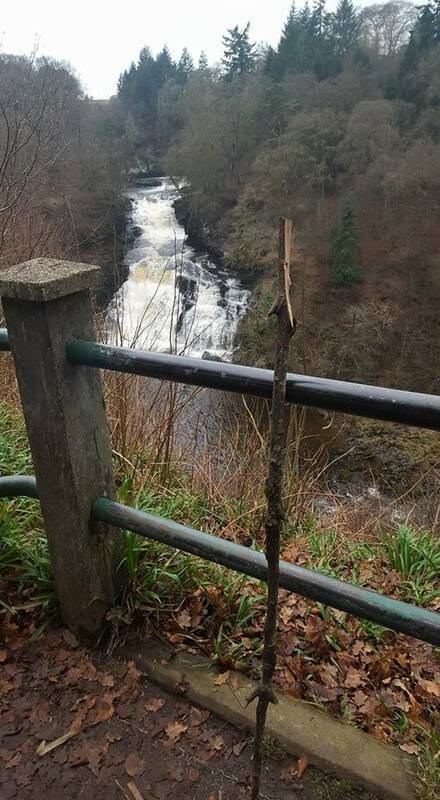 I leave him at a viewpoint, overlooking the falls. The Falls of Clyde is a magical wee walk, and you get such a feeling of power and intensity from it. It felt refreshing just taking it all in, and I'd recommend it to anyone who asks.